Sometimes I blog about parenthood. Sometimes I blog about toilets. And sometimes the two are the same. My sewing machine has pretty much gone untouched for more than two years now. I was getting quite comfortable with the fact that my mother-in-law wasted hundreds of dollars on it, I am a colossal disappointment, and I will likely never use it again. 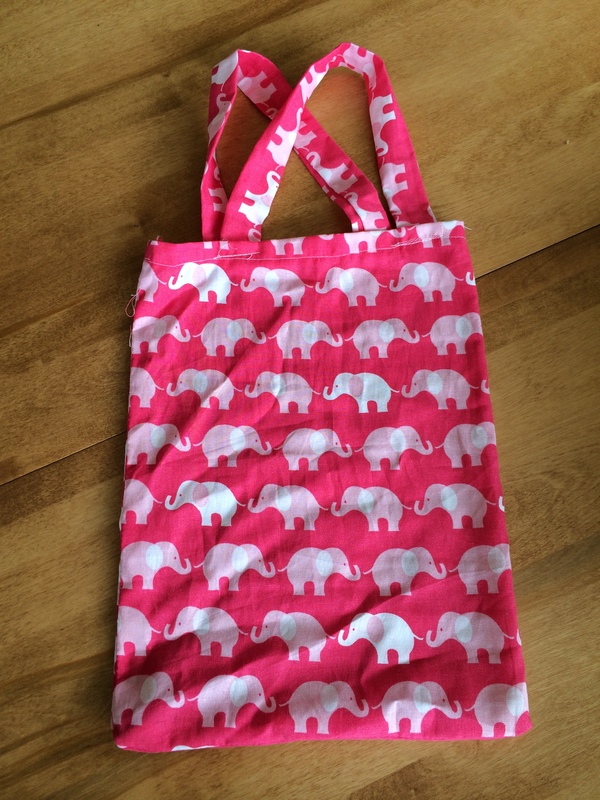 So naturally my daughter has decided that sewing is her life’s passion. This year she took a sewing class at school and over the past 6 months she has sewn more than I will probably achieve in my lifetime. 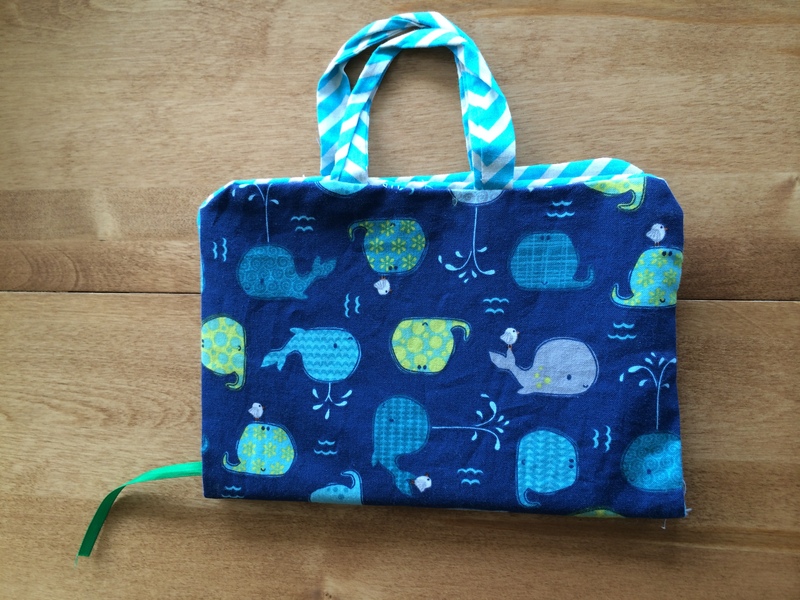 This is one of several tote bags she made. This is a book cover / carrying case. 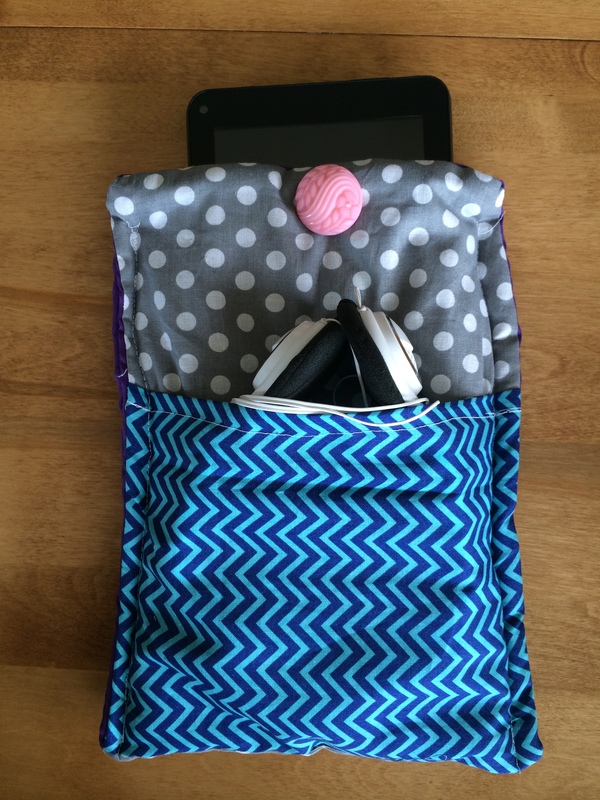 This one is the crème de la crème – a tablet case with a pocket for headphones. Well done, child. Your craftiness both impresses and distresses me. She has sewn hot pads, headbands, pajama pants – the list goes on. We have reached the point where my husband now asks my daughter to mend his clothing because he knows it will get done faster and better than if he does it himself or if, heaven forbid, he asks me to do it. I would be offended if I weren’t so relieved. So of course now here we sit almost two weeks into my child’s summer break, and what do you think she wants to do? Sew. And of course Mini Martha expects me to help. She is used to having a teacher. She needs a mentor. A leader. A guide to make sure she doesn’t lose a finger. And unfortunately she is looking to me to provide this support. I have been dodging the sewing bullet all week. I am running out of distractions and phony errands. I can only pretend to be on the phone with the cable guy for so long before she realizes we don’t have cable. She is hellbent on sewing curtains for her dollhouse tomorrow so clearly my only option is to wake up early and stage some sort of rat infestation by scattering mouse turds around the house and chewing small holes in the couch to convince her that our home is not only uninhabitable, but tragically unfit for sewing. Clearly that is the only solution. Clearly. She starts a camp on Monday and then I am off the hook for a bit. Here’s hoping I can make it until then without burning down the house. In the meantime I’ll be over on Craigslist buying up all of the mouse turds. UPDATE: It looks like there aren’t any mouse turds on Craigslist, which I found oddly surprising and a bit disappointing. Not a very comprehensive list, Craig. A few weeks ago I misplaced two tacos. No clue where they went. It still haunts me and I won’t rest until I find them. 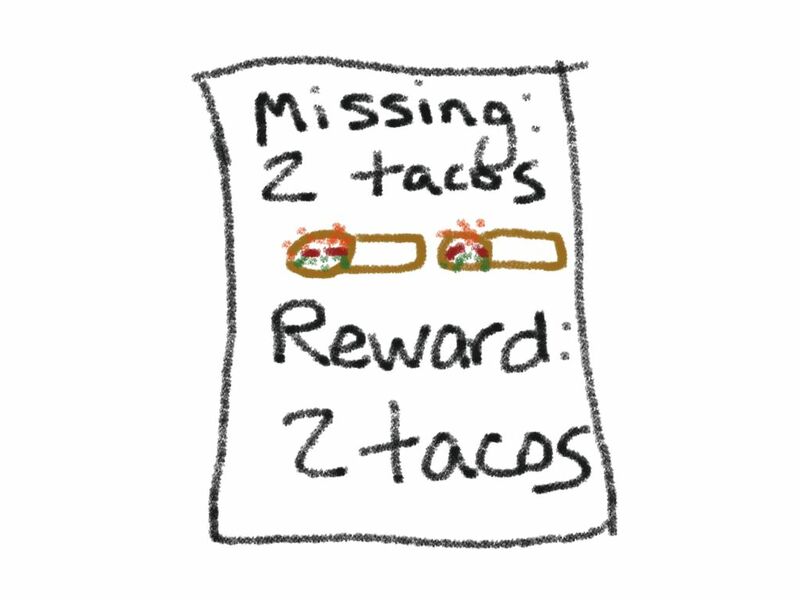 I’m not sure when I became a grown woman who loses tacos, but it seems like a step in the wrong direction. Today it’s tacos – tomorrow it’s my wallet, my phone or my children. And Lord knows I would die without that phone. So I’ve been trying to get my act together. Make some plans. Clear my space. Focus my chi. I don’t really know what any of that means, but I do know that it’s been tough. I am the type of person who needs 6-8 hours of solitude to feel like I can accomplish something, so it’s a real struggle to Get It All Done in the 6-8 minutes of solitude that tend to come with parenthood. 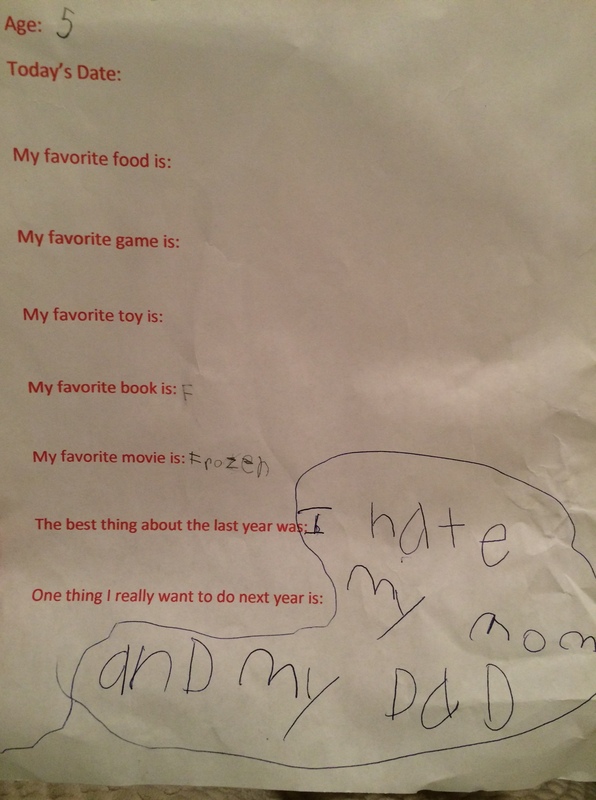 Kids, man. They bring loads of joy but they are also little tornadoes, tearing your plans apart and ripping the tacos right out of your hand. Step 1 of my Operation: Get Your Sh*t Together offensive has been to cut clutter and organize my house. Decluttering is both miserable and soothing. In order to cull through your mess, you first have to make an even bigger mess. Heaven forbid if you need to stop midway through – you might as well just burn your house down and start over. I got this idea from Pinterest. I don’t know why I bother. Kids are fun. I saved this in her baby book. 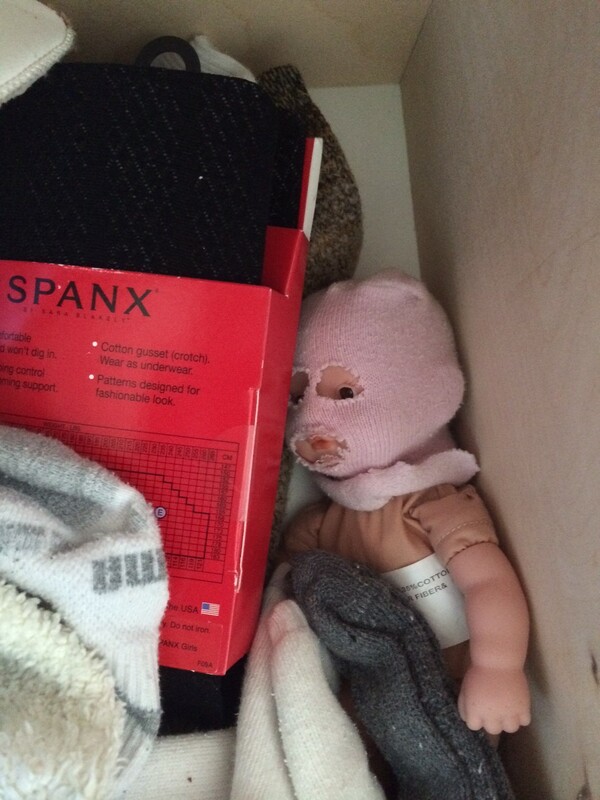 I also found this old gal in my underwear drawer. At least someone is enjoying the Spanx. Poor thing has been swimming in a sea of old maternity briefs and matchless socks for a year. There are two kinds of people in this world – those who throw out a single sock when its mate disappears, and those who hold on to that sock, holding out hope that there will be a reunion. 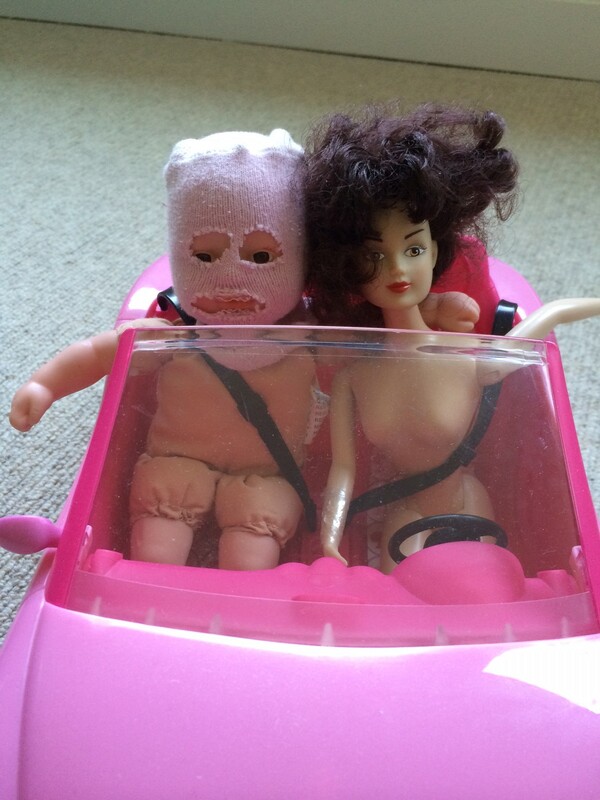 And then there are those of us who turn old abandoned socks into doll-sized ski masks. I should probably be in therapy. I’m not done with the clutter cutting, but I’m making progress. Next up is my closet. I don’t touch 95% of the clothes in there and have been contemplating the best way to cut the excess, other than lighting a match, and then I stumbled on this blog post. It describes my situation to a t(shirt). Ha I love puns don’t judge. The gist is that you create what trendy fashion people call a ‘capsule wardrobe,’ which is a mini collection of staples that you wear regularly and can mix, but you axe everything else. Errything. This is now my mission. I essentially do it already by wearing the same three shirts each week, I just didn’t have a cool name for it. I genuinely hope that clearing the spaces around me will help clear my brain so I can focus more and do some things I’ve been failing to do like write, read, exercise, invent something, cut my toenails, mow the lawn, learn to juggle, play the oboe, organize a flash mob…or honestly if I can just find those damn tacos I’d be happy. So far life in the middle ages is going OK. Not the Middle Ages. Just the middle ages. As in, my 40s. My apologies to anyone who was hoping for a summary of life during the Medieval period. As the title of this post suggests, I celebrated turning the Big 4-0 by purchasing a minivan. In hindsight perhaps I should have waited a few months. When you are already grappling with the reality that you are Halfway To Death, it would probably be better for your psyche to buy yourself stylish shoes or a saucy jacket vs. a boat on wheels. But alas it’s too late now. I am officially the proud owner of the most uncool car on the planet, and not surprisingly, I like it. It’s big, but so am I. It has power doors, which I deeply appreciate as a lazy person. It fits a buttload of people, and I have a buttload of friends. Ok fine, that last part is a lie. I use the extra seats to drive around a buttload of kids who scream too much and leave a trail of crumbs and filth in their wake. But whatever. As my neighbor said, it’s only for a season. Someday these screaming banshees will be able to drive themselves and I can buy a new Mercedes with leather interior, gold-plated hubcaps and a crystal chandelier. 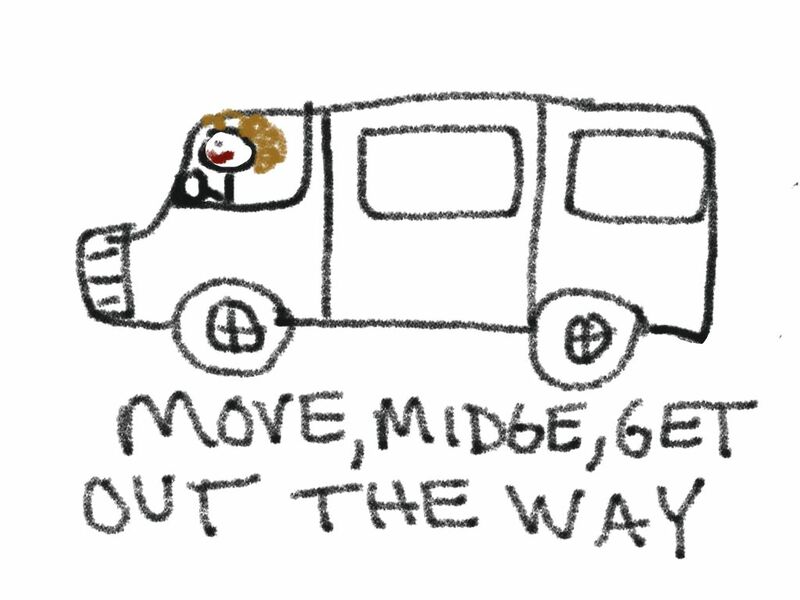 Until then, you will find me tearing around town in my used Dodge Caravan striking fear into the heart of every parent in the school pickup zone when I attempt to parallel park. COMING THROUGH EXCUSE ME PLEASE AM I IN REVERSE? WATCH YOUR TOES OOPS SO SORRY. It’s not easy being that driver, but somebody has to do it. Whoo boy I ended 2014 with a bust. I crashed and burned so hard on my NaBloPoMo effort which seemingly set things into a tailspin through the end of the year (I say this to justify if/when I never do it again). December overwhelmed me. It chewed me up and spit me out. I did not have the fortitude to withstand a month of holiday parties, end-of-year activities, gift-buying, illness, traveling, trying to bake with my children, and more illness. I just managed to take my tree down today, January 8th, before its dry crusty branches spontaneously combusted in my living room. But alas today I finally feel like I might be returning to normal. I managed to declutter my kitchen and I’m not going to lie – that might be my favorite accomplishment of the past 60 days. It’s an odd and alarming stage of life when you get serious joy out of things like clean counter tops. Perhaps not unrelated to this development, tomorrow I turn 40. I can’t decide if I care or not. I didn’t think much of it, but then all of a sudden I did. Am I really 40? Is that possible? Should someone double check the math on this? It’s a mind game. I’m just going to baby step it into this new decade and try not to overthink it. I have some very simple goals for the year ahead including to get more sleep, buy new socks and underwear, and remember to set the coffee pot to auto-brew each night so I can awaken to the smell and anticipation of fresh coffee each morning. The bar is low around here but I need some easy wins. 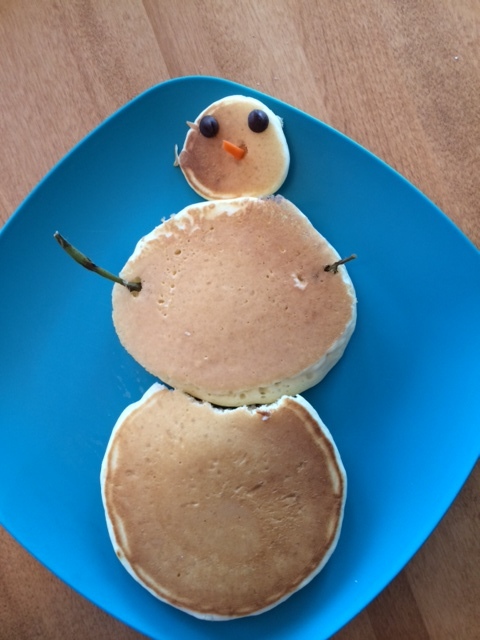 Also I’d like to eat more pancakes made by Mr. Martha. My husband rose to the challenge today and created this holiday masterpiece. 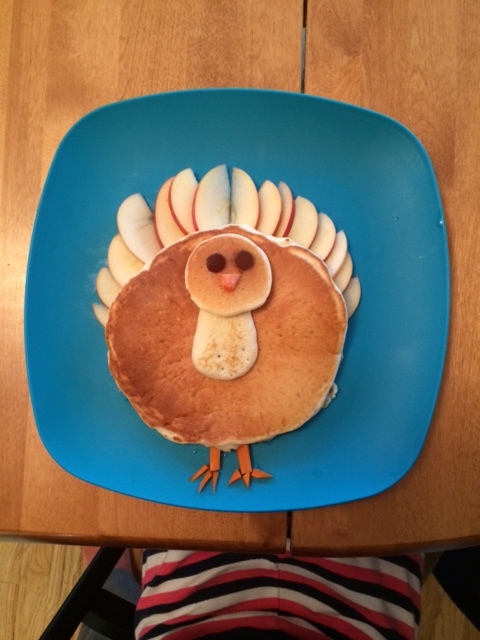 My kids loved it and at this point he has a pancake portfolio that could land him a guest spot on Martha Stewart. Or at least a temp gig at IHOP. But there is a dark side to this type of picture perfect cooking, and I feel the need to shed light on it. This type of artistry takes time. There is planning. Sketching. Fruit slicing. For the love of breakfast pastries, I think the man had to julienne some carrots to make those turkey legs. My children and I were beyond hungry by the time those cakes were done. My daughter shoveled that cake into her mouth so fast she almost choked. Know that for every beautiful recipe creation you see on Pinterest, behind the scenes there are famished families desperate to eat that damn food. Ask yourself – is it worth it? Or should I order them a pizza while they wait? This holiday gift guide, which has gifts that give back to the women who made each item, who are all survivors of abuse, conflict or disease. This post about the unquenchable thirst of kids these days, which I swear I was just thinking about last week as I was washing my children’s 472 water bottles. This great post by Wendi Aarons about how to write a funny post. I also read Amy Poehler’s new book on the plane last weekend and I loved it. She can do no wrong. The friend who convinced me to do NaBloPoMo is currently writing her second science fiction novel. When I went MIA last the weekend she assumed I had thrown in the towel on NaBloPoMo, so she generously sent me a few post ideas, and she even wrote me a guest post in an attempt to resuscitate me. Talk about friendship. Or maybe she just felt guilty for roping me into this. But I’ll give her the benefit of the doubt. She also said it was a good way to procrastinate writing her book. As it turned out I had already written a post on the plane so I didn’t need to use hers. But now here I sit four days later, with no post in my brain and I can no longer use hers because it was only applicable to my first day back in the saddle. Marstark was traveling through time when he realized he had forgotten his laser sword back on planet Arfdrart during his battle with the fishling king, Wanooknen. He shot some fire out of his fingertips to re-start the blaster engine, and then shot ice out of his toes to prevent it from overheating. Then a little more fire. Just a hair more ice. Fire. Ice. Fire. Ice. Marstark then combed his beard, tucked his tail into his leather pants and snapped himself into his Graco* 5-point harness car seat. Re-entry was going to be rough. * Shameless attempt at a big brand sci-fi sponsorship. Pretty sure I nailed the demographics on this one. Graco – have your people call my people and we’ll talk.